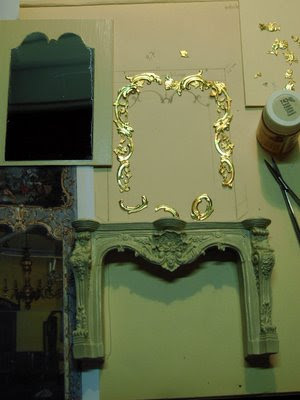 Yesterday Reiko asked me how I made the mirror which is in the Salon of my dolls house. I had to hunt for a picture but I have found one. I apologize for the quality, this photo was taken in the days I only had a very cheap digital camera at my disposal. So here's how I did it: I first determined the shape I wanted the mirror to have. For inspiration I used a photograph of an antique mirror I found on the internet. I cut the mirror material (obviously not glass but some sort of plastic) with a jewelers saw in the shape I wanted. Then cut that same shape from a piece of wood with the same thickness as the mirror. It has to be cut very precise, because the mirror is fitted into the wood (see top left of the picture). De gold decoration on the mirror is made with paper embellishments like Dresden Trim. You could just cut a frame from a picture of a mirror you like and use that. Maybe use some paper clay to give it some extra shape and depth. I have done that on the ceiling of the Salon and although it was a lot of work, it looks great. Paint the frame any colour you want. Done! You're welcome Reiko. Happy mirror making ;-) ! I've never worked with the mirror material. It it easy to cut (saw?) or do you really have to watch your fingers? I must have been to busy looking at other stuff (haha) but I've never noticed the mirror material or this lovely Dresden trim at the Arnhem fairs. Very, very lovely what you've done with both ingredients. And it's a lovely fireplace aswell. Le queda precioso, gracias por la explicación. Thank you Josje, I went to your other site but I could not read what you wrote, the "print" is somewhat blurred. Now everything is clear. Only one more question: what is Dresden trim? I have never heard of it. I know how you can miss half of what's on offer at the fairs, happens to me all the time. But I discovered this stuff years ago and have been using it ever since. I can't think of their name now. They're from Germany, from Soest even, if I remember correctly. They also sell beautiful soft metal trim. Rosanna, what do you mean the print is blurred? Do you mean you can't read the font type? Do you have a Mac? If you can't read the font type I'll have to look into that and change it. You're the first to mention this to me in all these years. Dresden trim is die-cut paper dating back to Victorian times. It comes in tons of shapes. I think its wonderful to work with. Google dresden trim and you'll find many online shops. If I think of the name of the German people who sell it I'll let you know. Very clever and it looks great finished. Thanks for the mirrror making info! It's always great to see how other people make things. Your mirror is beautiful! I'd love to make mirrors, seems a lot of fun. Nice! I like that mirror a lot! Great tutorial. Thank you Tallulah-Belle, it is really fun stuff to work with. There's so much you can do with it! Rosanna, how odd! I also have Windows XP and don't see what you've just mentioned. I have noticed on my mum's computer that the font looks a bit different, but that's because her screen has a much lower resolution than mine. I can't think why this doubling effect occurs with you. Sorry about that! You're welcome Mercedes, MiniKat and Julianna! you're welcome! What a fabulous idea to use the paper embellishments for the mirror frame. You are so resourceful.